It's that time of year again, when the DS Analytics Service takes a broad view of public media and finds the big trends everyone should know about. I have good news and I have bad news: Looking across the entire system, our station streaming is growing, but our audience isn't. When we roll up data from Triton for 173 station streams where we have consistent historical data, we find that total listening hours are up 9% from Q3 2013 to Q3 2014. That's not a huge increase, but it's reassuring. While listening time per session is fairly steady, the number of actual streaming sessions is on the rise, explaining the overall 9% increase. However, these additional sessions aren't tons of new listeners. Cume is actually down 5% in the same time period. This trend is fairly consistent with what we observed in the spring. Streaming trends for 173 station streams. While it's terrific that our existing audience is streaming a bit more often, it's worrisome that we're not seeing real audience growth, especially given all the research that shows listening is shifting more and more to digital. What does it mean? 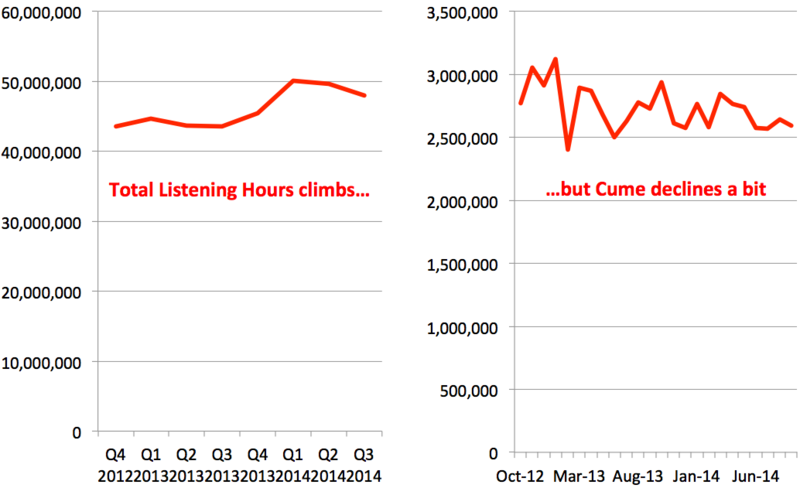 Are people shifting more to on-demand listening? (We're currently building a system-wide solution for measuring on-demand audio so we can find out.) Or are people moving away from public radio entirely? Or even just listening less in general? We do have a few clues about where public radio streaming is and isn't growing. News is seeing more growth than music. Total listening hours for news streams is up 13% year over year, while music is up only 2%. Cume for news streams is fairly flat, while music fell 12%. AAA and jazz streams seem to be hurting more. Although we clearly still have a loyal audience for music, Pandora and other competitors in the music space continue to chip away at digital listening to public radio music. Streams from large stations are growing more slowly than streams from other stations. Large stations aren't seeing much growth in the number of streaming sessions, and so total listening time is increasing faster for small and medium stations. Perhaps large stations (or their audiences in larger markets) are simply further along in transitioning to digital, so their growth is naturally slowing while smaller stations are earlier in the natural growth path. Streaming via station websites shows strong growth. Site sessions that include streaming are up 41% from Q3 2013 to Q3 2014. Smartphone streaming via our sites is skyrocketing (up 108%). Clearly our existing audience, already familiar with our sites, is coming back more and more to listen. Streaming via TuneIn, one of the biggest aggregators, has leveled off. A year ago we saw impressive growth across the hundreds of public radio streams in TuneIn, but in 2014 we see total listening hours holding steady and the number of unique listeners actually dropping a bit. A possible theory is that listening is still growing on our own properties - our sites and apps where loyal listeners who already know us are remembering to come back. But in the outside world, where aggregators flood consumers with so many listening options and people are less aware of public radio, we see listening falling. We need more data to see if this theory holds true, and fortunately we'll be seeing better data from Triton early next year. With so many media options continuing to multiply, the question we must continually ask ourselves is this: Are we competitive enough? Is our content sufficiently compelling to stand out to the audiences we want to target? Is our user experience unique and delightful? Are we focusing enough on distribution and marketing? Lots to think about. And that's the point of stepping back and looking at the big analytics trends. Data doesn't always give us all the answers, but it does help us ask better questions. To hear the more detailed version of this trend and see more of the data behind it, you can watch the PubMetrics Fall 2014 webinar.